Sixteen years old, bullied, heartbroken, and alone. The voices are heard, always, and they're much stronger than you think. Turning inside and listening to that voice, young Jo starts a desperate internal battle with that voice, one she had no idea could almost kill her. This audiobook contains, poems, stories, and journal entries bringing the realities of eating disorders to light through the darkest and the lightest of times. The struggles are real, the hope for recovery so far away...but possible. Trigger warning - contains deep poetry and inner thoughts, from physical to mental abuse to suicide. 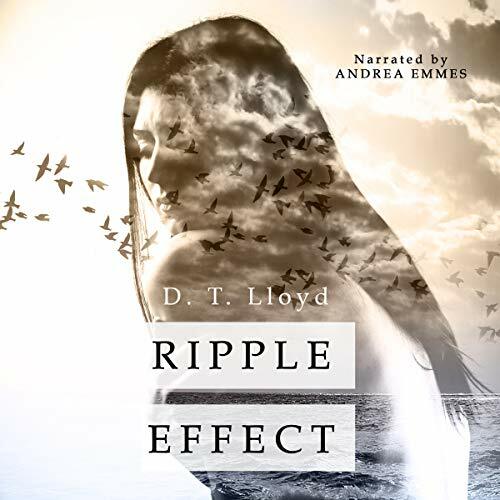 Ripple Effect was a good quick read by D.T. Lloyd. This is a book that deals with eating disorders and follows a woman dealing with an eating disorder. It consisted of poem, stories and journal entries. This book definitely touches on some very sensitive subject matter. Anyone that has had, or as wanted to know about an ED, should read this. It's written from the point of view of the people that deal with an eating disorder and has struggled with it. The poems are powerful, and heartfelt, short stories or where on point. Though for me some of that was hard to listen to, ( I had an ED) This is very worth the listen. A deep, emotional peek into the life an amazing woman's struggle with an eating disorder. D.T. Lloyd's words had my heart aching for the pains Jo endured and triumphed in the demons she vanquished. The story is a collection of journal entries and poetry, of which the latter I especially enjoyed. Andrea Emmes in turn, delivers an emotionally charged performance that can't help but affect you. This performance had me running the gamut of emotions, from happiness when you could see the corner was turned to sadness when the slips happened. Andrea did an amazing job portraying all of those emotions with her performance. I can’t imagine the skill and strength of will it took to get through some of the sections worth the emotions that were needed. The book itself gives you a large insight into what the character was struggling with and how she felt and why she did what she did. You are brought a long for the whole roller coaster that was her life for those years. You feel the struggle that is there everyday and you can tell this story is real and there is experience behind it. I couldn’t tell at the end of they were tears of joy or sadness that i was feeling, I think it was a combination of both. This book made me be introspective on things in my life and how I handle them, it made me reevaluate some of my past and see that maybe I need to do more than I did to get past things. Fantastic, eye opening, and very welly narrated. This audio gets a 10/10 for me.